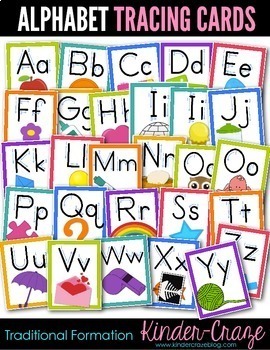 Foster alphabet recognition, phonics development, and proper letter formation with this set of Alphabet Picture Cards in Traditional Formation. Each card measures 7” x 9.2” and displays the capital and lowercase letter and a coordinating brightly colored image. Most importantly, numbered arrows are included beside each letter to guide students as they learn the strokes for writing each letter. Print each alphabet picture card and trim to remove white edges. 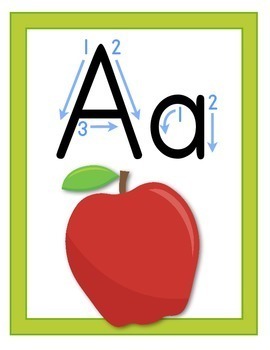 Laminate each card and bind together into a book for students to trace the letters step-by-step. For best results, have struggling students trace each page of the book while they recite the letter and picture name on the page. Consistency is important for pre-emergent readers. 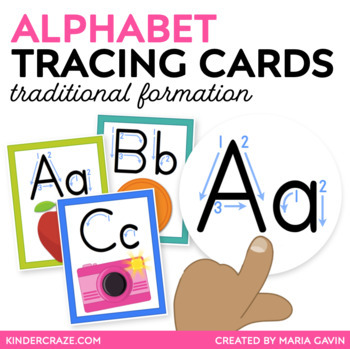 This set of alphabet tracing cards works best when paired with coordinating alphabet resources. Alphabet Picture cards for display in a classroom are available in two background color schemes (blackor white). 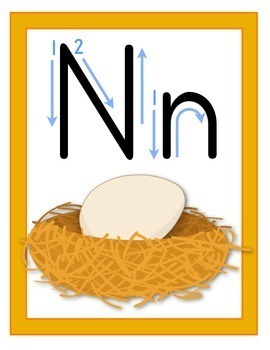 Each set displays the same graphics as the alphabet tracing cards to help pre-emergent readers make essential letter-sound connections. 8/3/17 UPDATE: Now includes short and long vowel options, as well as alternate pictures for T and V.